If you are considering plastic surgery, there are many important decisions you will make regarding the ideal treatment for your needs and the overall process involved. The selection of your plastic surgeon is one of the most vital steps, and it is necessary to understand the differences between the various types of doctors who offer cosmetic enhancement procedures. 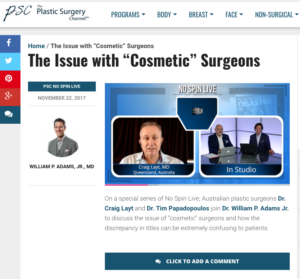 Our experienced, specialty-trained plastic surgeon, Dr Craig Layt, was recently invited to appear as part of a panel of experts on the Australian Edition of No Spin Live to talk about these differences and discuss an alarming trend: patients who are being treated by “Cosmetic” Surgeons who may not be qualified to offer certain types of aesthetic services. You can view the entire segment on No Spin Live here. Please contact The Layt Clinic for more information, or to schedule a consultation. When searching the worldwide web, people sometimes misspell the name of our plastic surgeon’s name.